The Eco-8 Maxi In-line Water Filter is an under sink water filter for direct in-line connection to your main kitchen tap, fridge or water cooler. The great thing about the Eco-8 Inline Water Filter is that it can be installed easily onto your main kitchen tap and removes the need for a separate faucet dispenser tap. 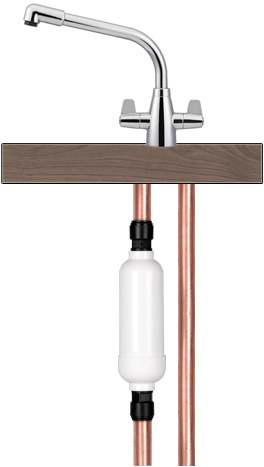 2 – It is easy to install onto the main kitchen faucet, so no need for dedicated filter tap. Easy: Easy to fit, under sink water filter. Dual stage filtration produces instant, cold filtered water for drinking and cooking. No separate tap required. 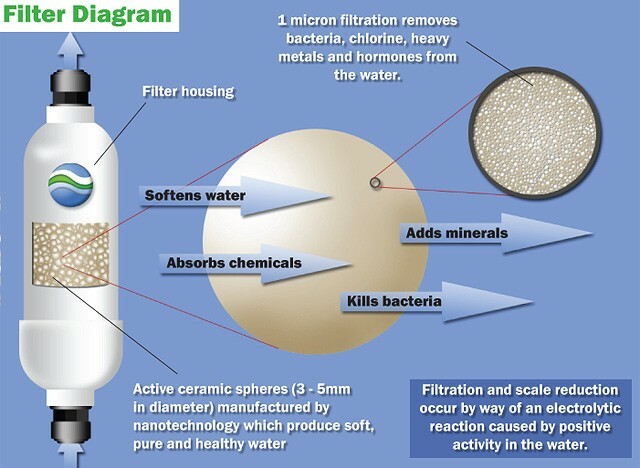 Unique: Unique filtration method produces gentle, soft, non-scaling water.Removes/Reduces:Chlorine (99% removal in both hot and cold water at recommended flow rate 4-5LPM), Fluoride, THM’s, PCB’s, Lead, Arsenic, Barium, Cadmium, Chromium, Selenium, Mercury, Iron and heavy metals. Construction: White ABS, does not rust. Media: Active ceramic spheres are porous and absorptive, and filter effectively to 1 micron. The ceramics control and eliminate bacteria growth, removes and reduces chlorine and heavy metals, prevent build up of scale in pipework and appliances, and re-mineralise water with nutrients. Approvals: The active ceramics have won NSF 42 approval. This is the internationally recognised American standard for drinking water media and products. The material of the spheres is also approved by the Water Research Centre under the Water By-laws scheme for use in contact with potable water. Eco-Advantage: The active ceramic media is natural and therefore 100% degradable and can be scattered in your garden to improve soil drainage and plant growth. The filter housing is 100% reusable and can be returned to us for recycling. 12 month longlife drinking water filter for healthy, purified water - life of filter may vary depending on water hardness and local water quality. Active ceramics remove and reduce contaminants such as chlorine, fluoride, Hormones, heavy metals (including lead, copper, iron, mercury, arsenic etc), VOC’s, THM’s, pesticides and chemicals - solvents such as Benzene. No need for separate filter tap or feed. Installs inline under your sink on mains cold water feed. High flow rate due to 15mm push fit fittings - up to 15 litres/minute. Alkaline, filtered water which removes and reduces chlorine, heavy metals, bacteria, reduces fluoride, reduces and removes toxins and VOC’s. Healthier drinking water, wash all fruit and vegetables in filtered water for improved taste. 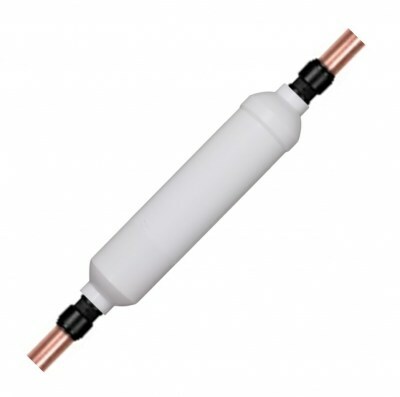 Easy to fit to mains water supply under your sink.